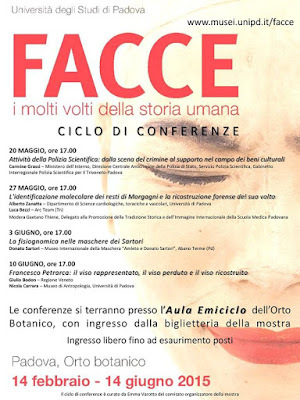 The face of Giovanni Battista Morgagni was showcased at FACCE exhibit since February 2015, however its official presentation took place on May 27th, at the facilities of the Museum of Anthropology of the University of Padua, as part of a cycle of lectures about the exhibit, which was held until June 14. 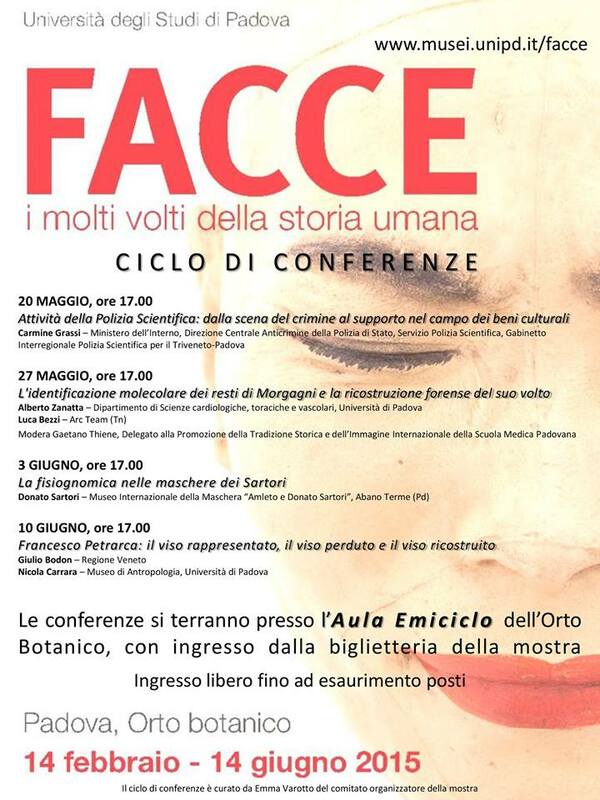 The lecture L’identificazione molecolare dei resti di Morgagni e la ricostruzione forense del suo volto (Molecular identification and facial reconstruction of the remains of Morgagni) was presented by Dr. Luca Bezzi, Arc-Team's archaeologist and researcher, and Alberto Zanatta, one of the scientists responsible for the identification of the remains of Morgagni. Read the research paper here. 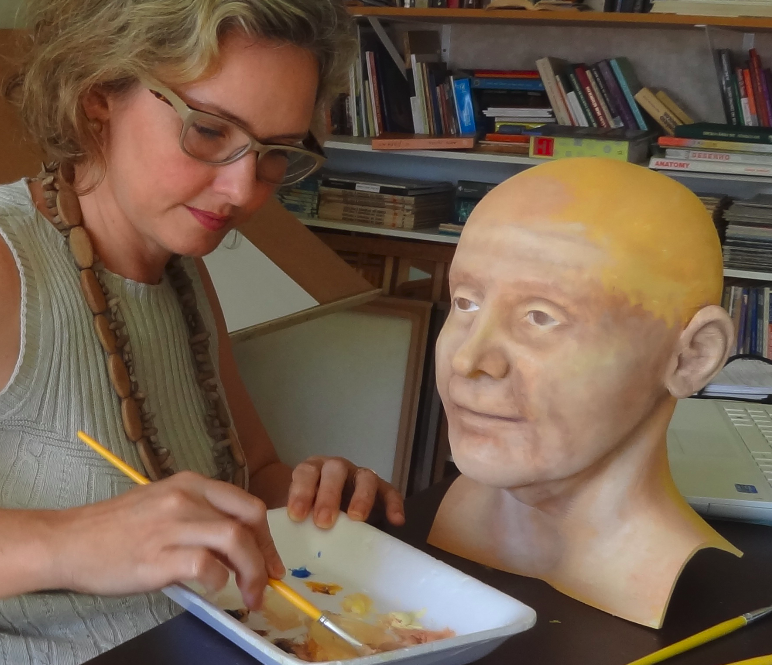 Meanwhile in Brazil, artist Mari Bueno gave the finishing touches on the 3D printed face of the great Italian scientist. The artist worked from a print sent by CTI Renato Archer. There were some schedule alterations with the Italian staff during the work. Initially the bust was to be presented in April this year. 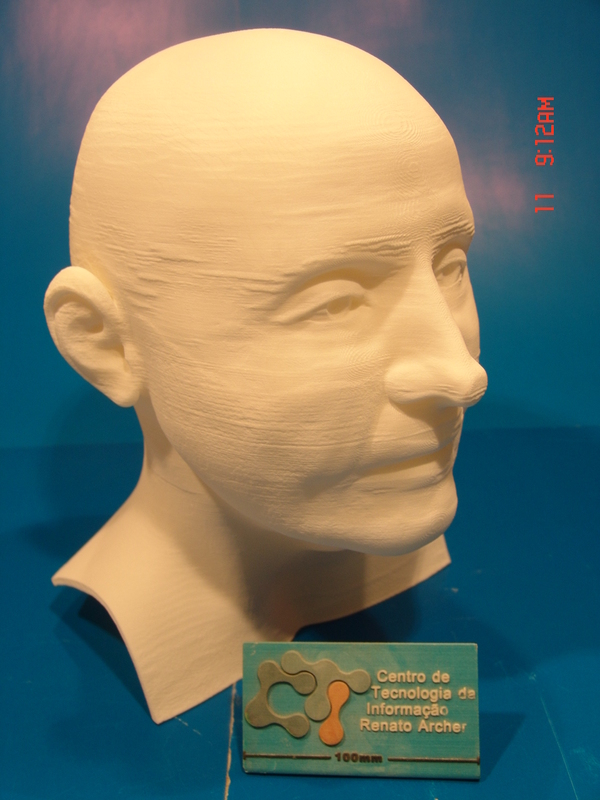 CTI printed a test within the deadline we had for painting and shipping it to Italy being, however the 3D print had small irregularities on its surface. CTI's head of the sector suggested a new print, but as time was tight, I asked them to send me the piece anyway, as I could correct irregularities manually. It was difficult to convince the DT3D staff to send the bust, as they did not want an impression with irregularities to be shipped (this agency really focuses on quality standards), but at that time we had no alternative. I take this opportunity to thank the CTI for their support and partnership, without it this job would prove nearly impossible to be done. 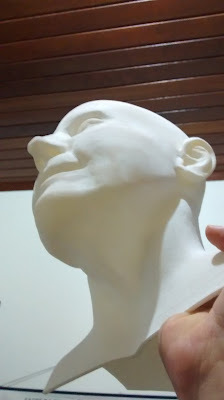 Initially I thought it would be enough sand the bust, and the problem of irregularities would be resolved, but you cannot imagine, dear reader, how hard this material actually is. It simply destroyed 3 sanding sheets of coarse granulation, but barely changed its surface! I had to apply 3 layers of spackling material, waiting one day for each layer to be completely dry. I was finally able to sand the surface and it got smoother. 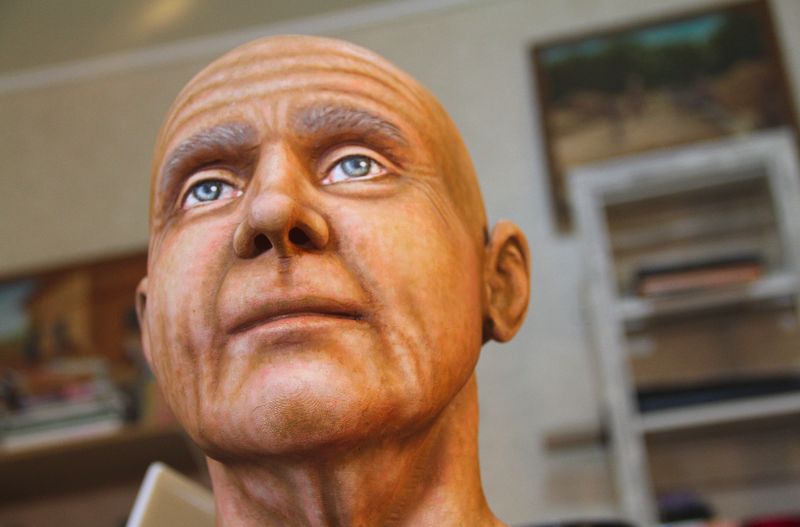 The bust was ready to be painted. Initially, the renowned artist filled in the region of the crystalline lens, so it would be apparent side view. 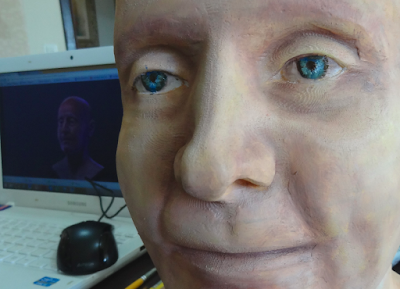 The face then received the first layer of paint. 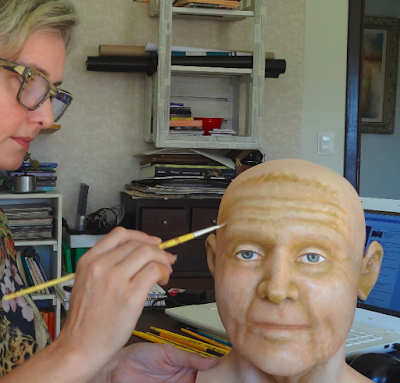 Day after day the layers were superimposed in order to approach the characteristics of the digital facial reconstruction, but at the same time respecting the style of the artist. The first layers of the eyes began to emerge. The enhancement of expression marks by creating new layers. 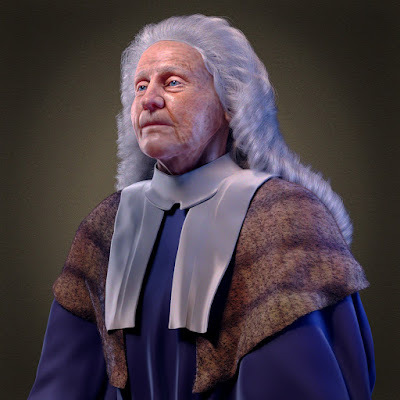 Ecco il volto di Morgagni in 3D! 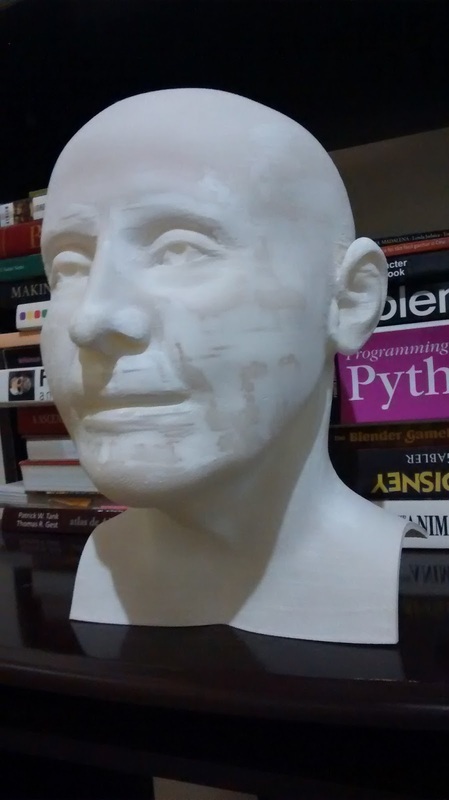 Here's Morgagni's face in 3D! 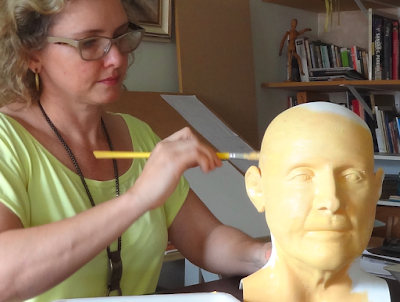 Mari Bueno, as shown in the video above, went to Padua where she would meet Dr. Alberto Zanatta to hand him the painted bust. 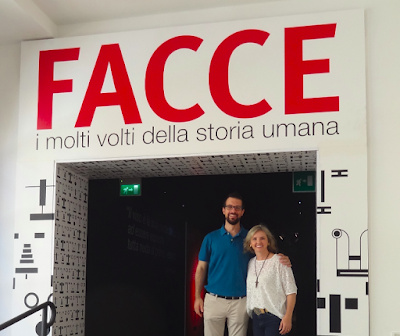 The two seized the occasion and visited the exhibit FACCE. i molti volti della storia umana. 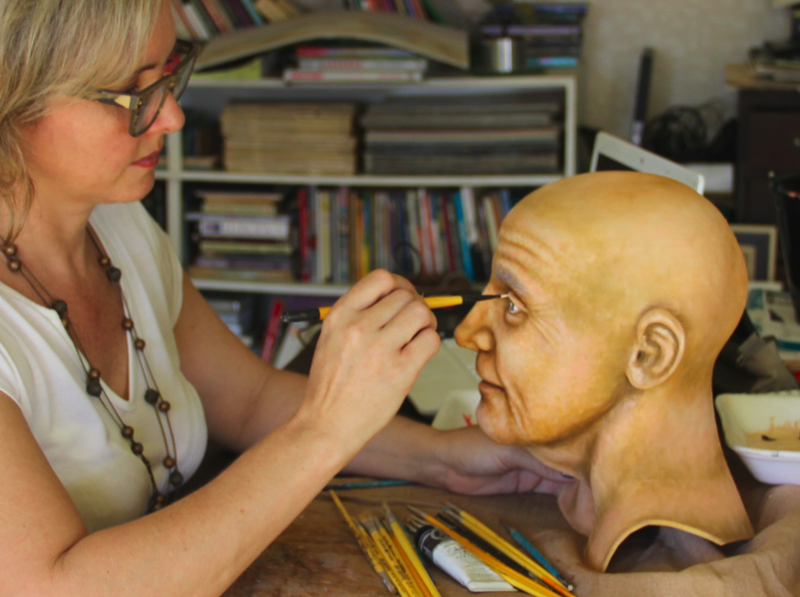 She could finally see the Saint Anthony's bust she retouched. 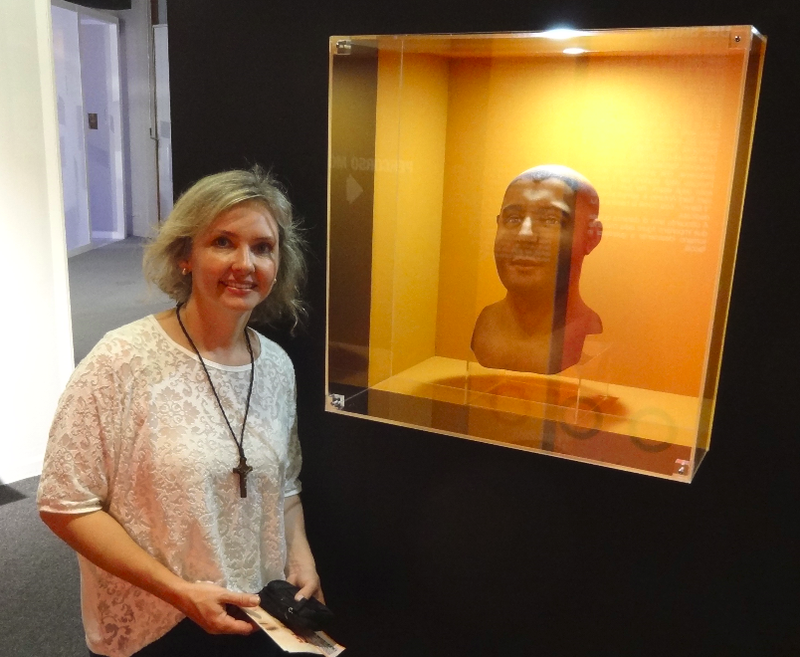 The very same bust that originally would be presented in Sinop (Brazil), but came across the people of Padova and ended up staying there. I'm really glad to see the results of all this work. 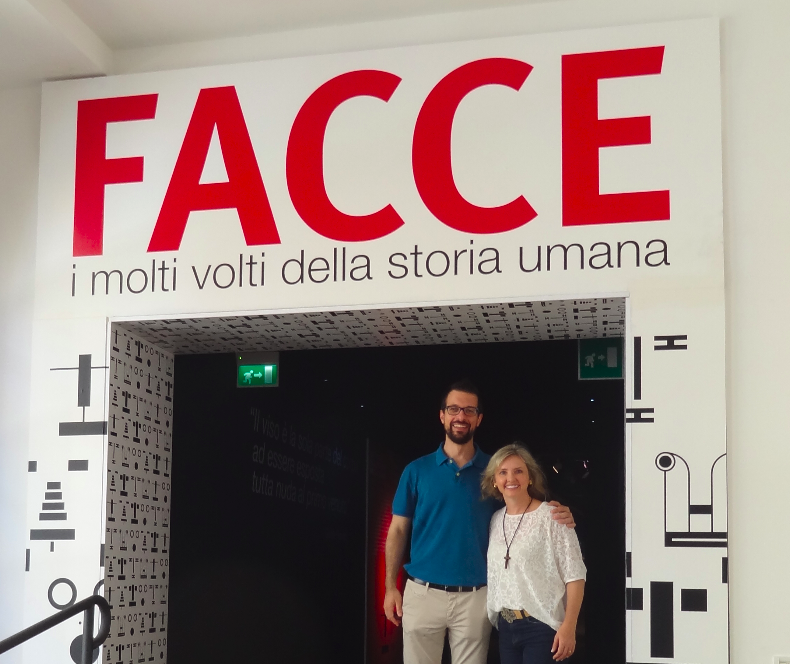 A year ago I was in Padova, in the most important journey of my life, at that moment I had no idea about everything that would happen in the meantime, so many joys and honors, many partnerships in the name of science that ended up introducing me to great comrades.. I am very grateful to everyone who took part in this story and is already included in advance on every single other that might take place from now on. Greetings to my friends and "capos" of Arc-Team, Antrocom Onlus, Antonian Studies Museum, CTI Renato Archer, Ebrafol - Brazilian Team of Forensic Dentistry and Anthropology, as well as the Museum of Anthropology at the University of Padua. And thank very much to Dr. Paulo Miamoto from Brazil, to translate this text to English. as I promised, we are back with new post in ATOR. We start today with an experiment we wanted to do since long: a comparison between two Structure from Motion - Muti View Stereoreconstruction (SfM - MVS) suite. 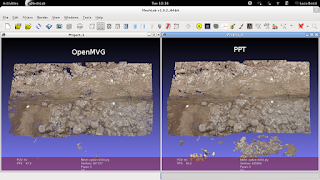 The first is Python Photogrammetry Toolbox, developed by +Pierre Moulon some years ago and integrated in ArcheOS 4 (Caesar) with the new GUI (PPT-GUI) written in Python by +Alessandro Bezzi and me. The second one is the evolution of PPT: openMVG, which Pierre is developing since some years and that will be integrated in the next releases of ArcheOS. Our small test regarded just four pictures taken with a Nikon D5000 on an old excavation. We want to point out the speed of the overall process in OpenMVG, which gave a result compatible with the one of PPT. 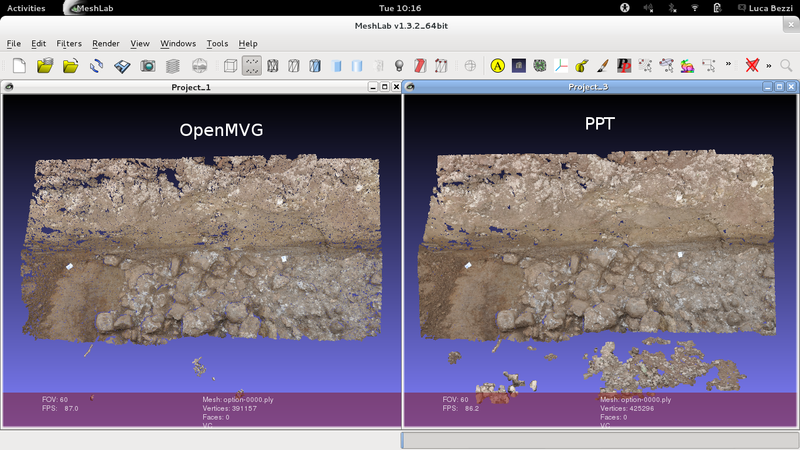 In the image below you can have an overview (in +MeshLab) of the two pointclouds generated bye the different software: openMVG processed a ply file with 391197 points, while PPT gave us a result with 425296 points. The main different stays in the processing time. In fact, while PPT needed 16 minutes, 11 seconds and 25 tenths, openMVG complete the model in just 3 minutes, 28 seconds and 20 tenths. We will go on in working and testing openMVG, hopfully posting soon news about this nice software. 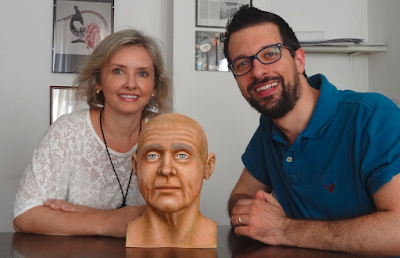 Many thanks to +Pierre Moulon and +Cícero Moraes for the help! As you probably noticed it is a long time we do not write something new in ATOR and the reason is simple: summer is the most productive season for archaeologists, so most of us are working in the field and we have no time for new post. Luckily we are engaged in new interesting projects and this will give us the opportunity to experiment new solutions and test new techniques, so we will have soon new material to share through ATOR. In the meantime, like I did in 2013 with this post, I leave you with a short "Intervallo", just to tell that we are still active and that we will come back soon with new post and articles.